As many of you are by now aware, the most important contractual clause to consider from a litigation standpoint is the indemnity clause. Indemnity is defined as the right of an injured party to claim reimbursement for its loss, damage or liability from a person who has such duty. In other words, your Client wants you to promise to reimburse them for damages caused by your negligence. 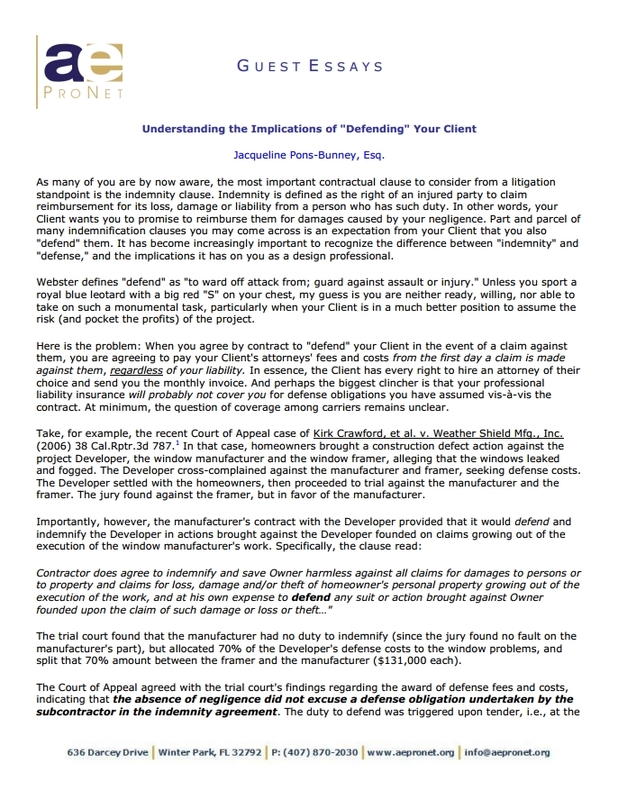 Part and parcel of many indemnification clauses you may come across is an expectation from your Client that you also “defend” them. It has become increasingly important to recognize the difference between “indemnity” and “defense,” and the implications it has on you as a design professional. The everlasting quest to exceed Owners’ expectations is driving innovation in the construction industry. Owners are demanding that complex projects be completed more quickly and cheaply. 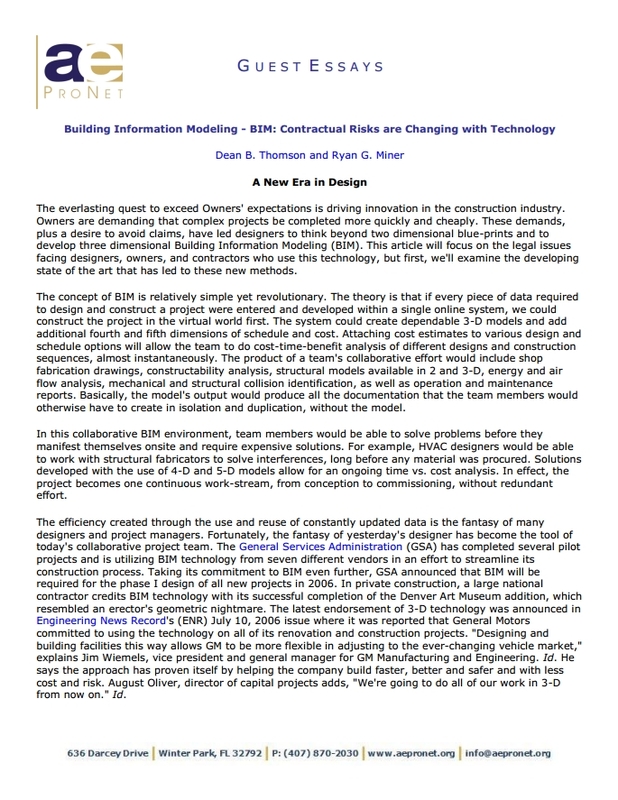 These demands, plus a desire to avoid claims, have led designers to think beyond two dimensional blue-prints and to develop three dimensional Building Information Modeling (BIM). This article will focus on the legal issues facing designers, owners, and contractors who use this technology, but first, we’ll examine the developing state of the art that has led to these new methods. 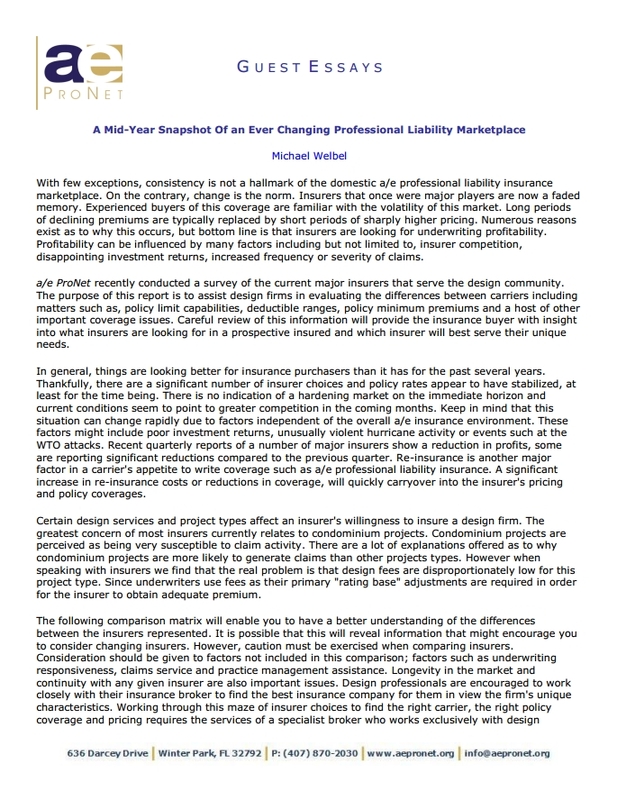 With few exceptions, consistency is not a hallmark of the domestic a/e professional liability insurance marketplace. On the contrary, change is the norm. Insurers that once were major players are now a faded memory. Experienced buyers of this coverage are familiar with the volatility of this market. Long periods of declining premiums are typically replaced by short periods of sharply higher pricing. Numerous reasons exist as to why this occurs, but bottom line is that insurers are looking for underwriting profitability. Profitability can be influenced by many factors including but not limited to, insurer competition, disappointing investment returns, increased frequency or severity of claims. Mixed-use condominium projects have increased significantly over the last several years. 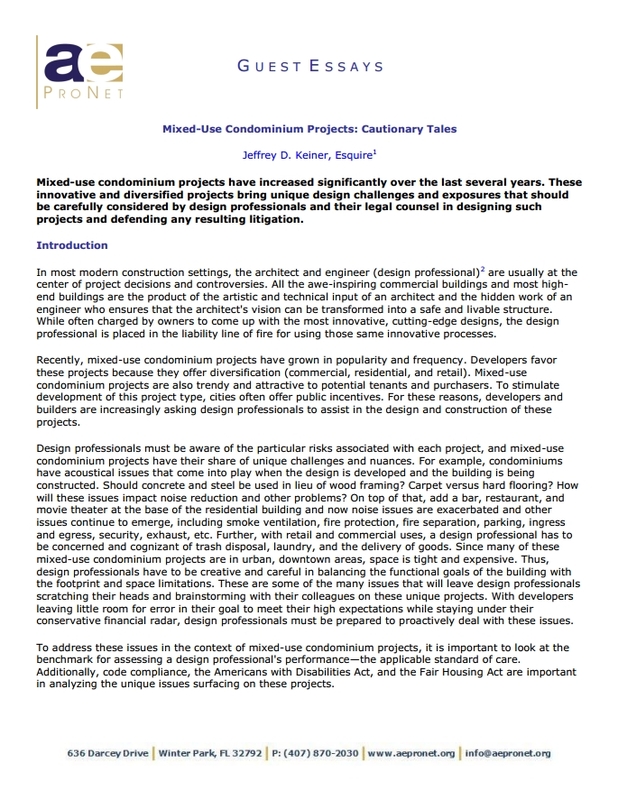 These innovative and diversified projects bring unique design challenges and exposures that should be carefully considered by design professionals and their legal counsel in designing such projects and defending any resulting litigation. After a few hundred years of the development of American law, one would think that there are concrete answers to legal questions and that good lawyers will provide that concrete, yes or no answer with just a phone call. When lawyers begin any response with, “Well, that depends on . . ,” our clients groan, begin hitting themselves with the phone and decry the existence of all things legal. 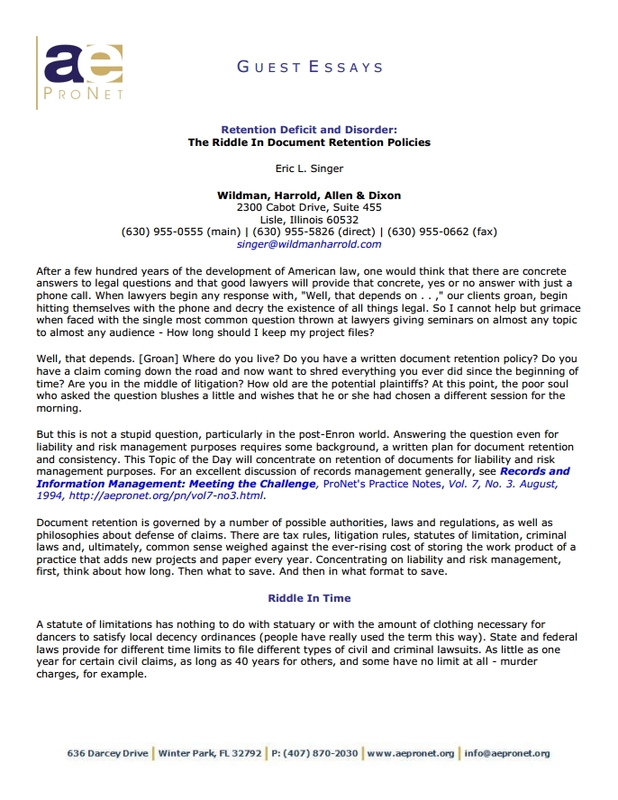 So I cannot help but grimace when faced with the single most common question thrown at lawyers giving seminars on almost any topic to almost any audience – How long should I keep my project files?